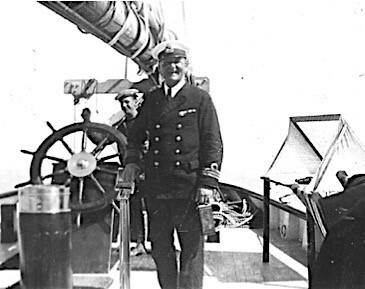 From 1929 until 1931, the schooner Zodiac was owned by Arthur J. Nesbitt (photo below), of Montreal. 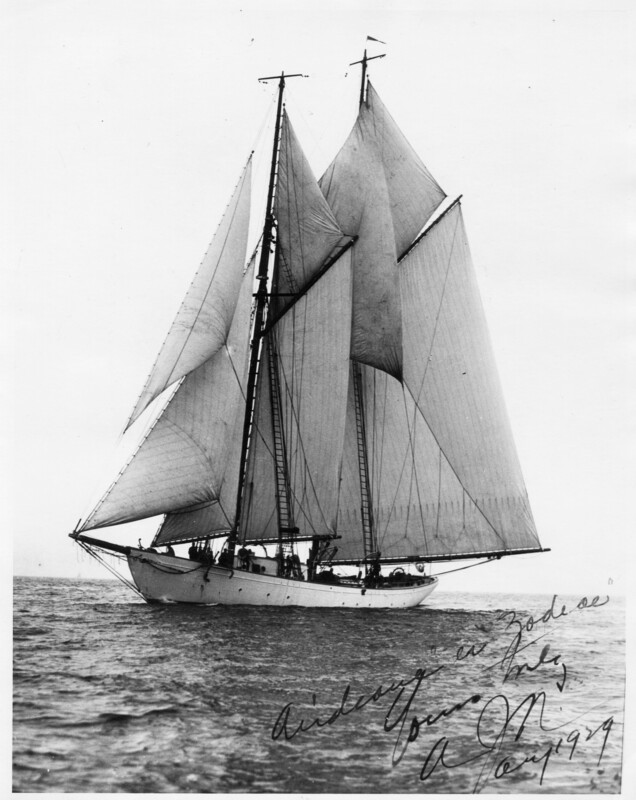 He renamed the schooner Airdeane, after his two sons, Aird and Deane. Nesbitt docked the vessel in Nova Scotia and it cruised the coasts of Labrador and the Canadian Maritimes. In a newspaper article on the Airdeane it’s noted that it cruised the West Indies, as well. At that time, the schooner still had its portholes and the configuration inside was still as it was when it was built – five staterooms, heads, a large main saloon, and crew’s quarters forward. 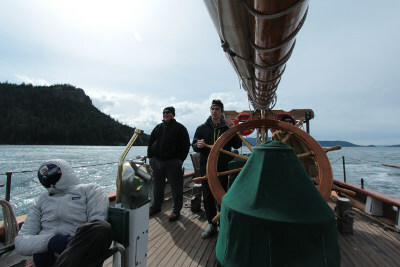 The schooner had electric refrigeration, electric deck machinery and a heating unit. The captain and a member of the crew are shown below. This was probably the only time when the schooner had a piano on board – not just a regular piano, but a grand piano. Nesbitt played both piano and organ and in the house he built in Montreal, he installed both. As this was in the days before electronics, a room in the basement housed all the mechanics to reproduce the sounds of the instruments, together with a large air blower for the pipes. Born in the Canadian Maritimes, Nesbitt sold dry goods throughout that area by horse and cart at the age of 17. His friend, Peter Thomson, sold Heinz pickles in the same way. In 1912, they co-founded what became the largest investment bank in Canada. Nesbitt Thomson, now BMO Nesbitt Burns, celebrated its 100th anniversary in 2012. At its largest, the company had offices in North and South America and Europe, including 20 offices in the US. In 1968, the firm bought a seat on the New York Stock Exchange, the first non-US firm to be accepted in over 30 years. After the stock market crash in 1929, Nesbitt and Thomson each went into personal debt, which they carried most of their lives, to ensure that not a single employee of the firm would lose his or her job because of the Great Depression. Consequently, no employee did. 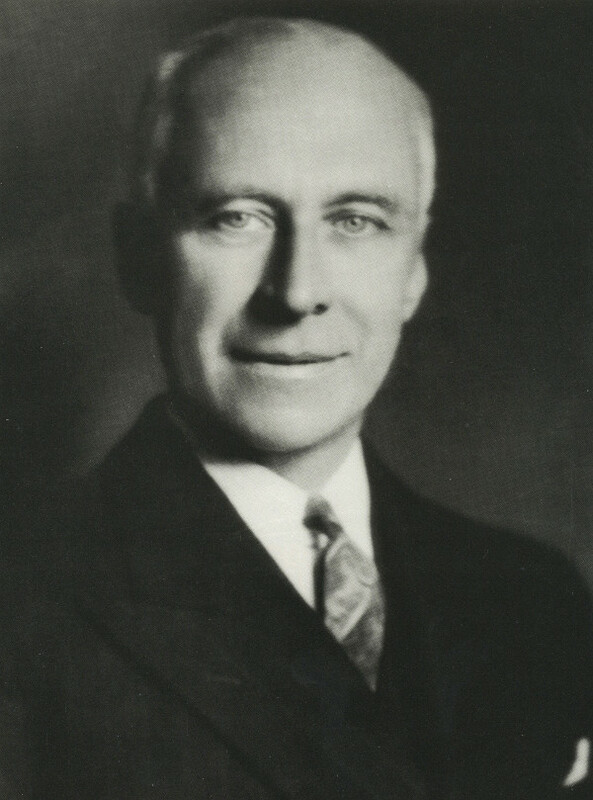 In 1931, Arthur J. Nesbitt donated the Airdeane to the Grenfell Mission, which provided medical and educational services to Labrador and Northern Newfoundland. The vessel appears to have been purchased the same year by the San Francisco Bar Pilot Association and renamed the California. 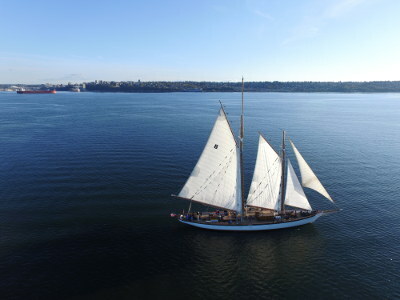 As both the Grenfell Mission and the San Francisco Bar Pilot Association lost records, the brief history of the schooner between ownership by the Grenfell Mission and the San Francisco Bar Pilot Association is not known. Courtesy of the Johnson & Johnson family we are excited to share this historic footage of the Zodiac sailing up the Canadian East Coast into Arctic waters. While being recently built the year before the Zodiac proved her worth on this expedition north! The footage was edited by the Zodiac’s very own crew member Taylor Hodges! 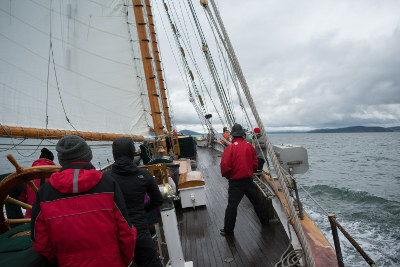 The Schooner Zodiac has already had a season rich in marine mammals, exploration of life in the intertidal zone during shore visits, and many sea bird sightings as we are underway. As the Zodiac passes through the Puget Sound, we get to enjoy the rich habitats protected by the San Juan County Marine Resources Committee and Washington Department of Fish and Wildlife. 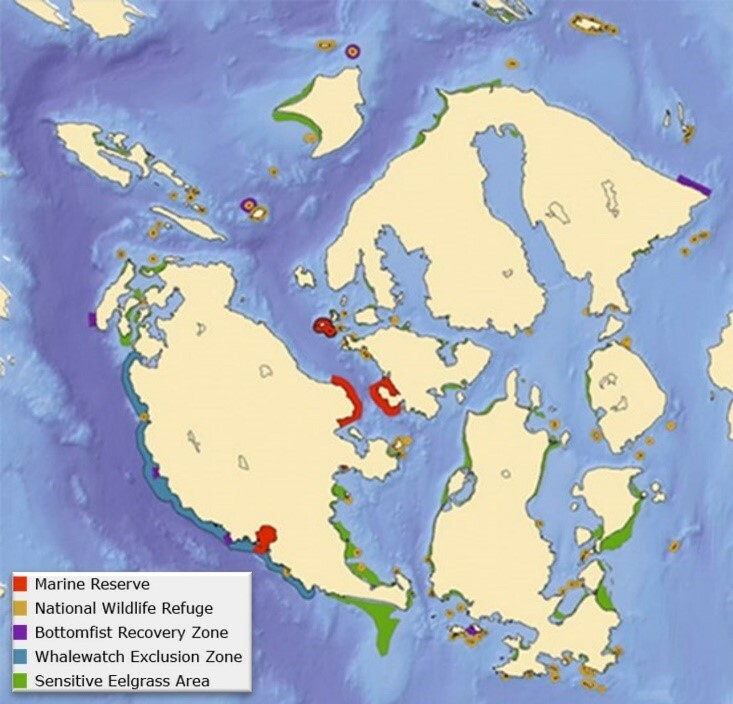 Together, with the goals of research, education, recreation, and conservation, these organizations protect the vitality of the Puget Sound through designations such as Marine Protected Area, National Wildlife Refuge, and Sensitive Eelgrass Areas. While whale sightings have been a bit more elusive, the ship has been visited regularly by Harbor Porpoises. These marine mammals are cetaceans, a category which also includes whales and dolphins. After experiencing a severe population decline in the 1970s, the Harbor Porpoise made a comeback, which has been attributed to a decline in gill net use and pollutants entering the water from industry (www.seattletimes.com/seattle-news/harbor-porpoises-now-a-common-sight-in-puget-sound/). We also often see the shy Harbor Seal as it swims with just the top of its head visible above the water. In addition to marine mammals, we get to experience a diversity of organisms on shore. The intertidal zone (where the sea meets the shore) hosts marine invertebrates such nudibranchs, barnacles, sea anemones, and sea stars, as well as a macrophytes (marine plants) and algae. Shore visits are rich in plants such as Oregon Grape, Manzanita, and Madrone trees. Some anchorage sites, such as Spencer Spit, host a National Wildlife Refuge with protections in place for sea birds and land animals. Thank you to everyone who made the Zodiac’s 2017 Spring Cruises a success! 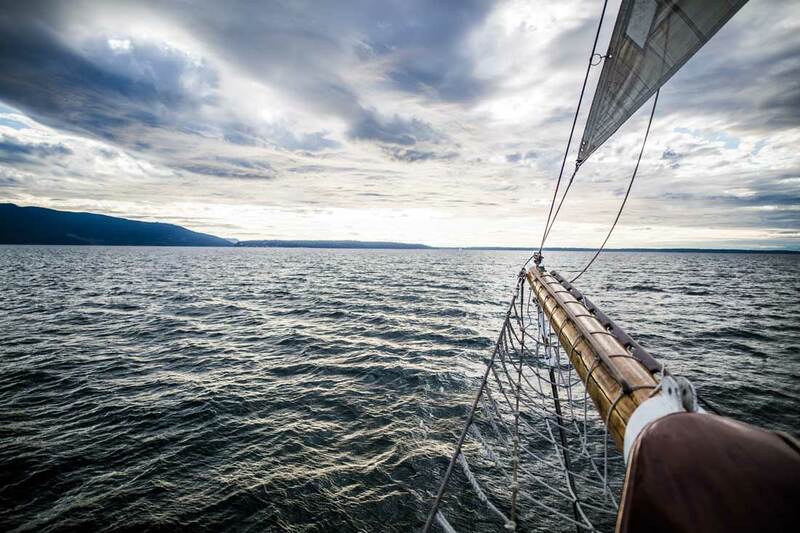 Now that we’ve reached Summer it’s nice to take the time to look back on how incredible the early sailing season has been for the Zodiac, her crew and of course the fantastic passengers who enable us to maintain and sail the 93 year old ship! 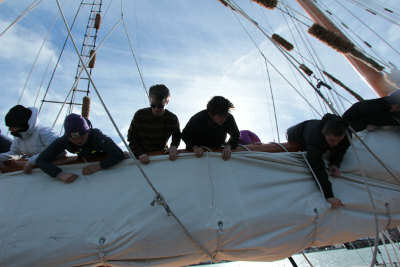 We wrapped up our frigid maintenance projects in March and began sailing with a trim new transom. We have been very fortunate to be joined by several local Pacific Northwest High Schools, organizations and folks from the public during the last three months! 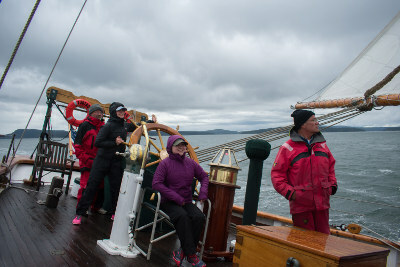 We’ve enjoyed overnight educational sails, our 4-day Lighthouse Tour, Our first Port Call in Tacoma in a nearly a decade and an exquisite Mother’s Day Brunch Sail on Bellingham Bay! Here are some snap shots from the beginning of our 2017 sailing season! After a decade of faithful service from our old website it was decided that we needed to modernize and have a more mobile friendly site. We worked with Peter James Studio here in Bellingham and they designed a programmed a beautiful site that functions extremely well. We would also like to thank our crew member Taylor Hodges for the use of many of his beautiful pictures and video content which adorn the site. And last, but not least we would like to thank Rory Maclysaght and Gunnar Goerlitz our previous webmasters for tirelessly keeping the old site updated and special thanks to Rory for helping with the transition to the new one. Please explore the new website and check out what the Zodiac is up to for her 2017 sailing season. We ask for both feedback and patience while we get everything online and shipshape! We hope to see you aboard soon!